was founded in 1835 under the name of Waterloo. In 1938 it was named after Stephen F. Austin, founder of Texas. Since 1839 Austin is capital of Texas. Big employers are Dell, IBM and Motorola. Austin is often called “Silicon Hills”. Austin’s University of Texas is one of the biggest in the U.S. There are several other private institutions. 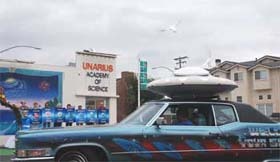 The Unarius Academy of Science is a tax-exempt, non-profit educational foundation centered in El Cajon, California. The Academy´s purpose is to teach the “connective and higher spiritual understanding of consciousness as an evolutionary mandate attainable by all individuals searching for the meaning of life”. Unarius is an acronym for Universal Articulate Interdimensional Understanding of Science. 145 South Magnolia, near Main St.
Republic of Croatia dedicated the year of 2006 to Nikola Tesla, the Worldly outstanding scientist and inventor, born on 10th July 1856 in Smiljan. 2006 in Croatia is the “Year of Nikola Tesla”. The year of Nikola Tesla is the occasion to celebrate thoroughly the works of Nikola Tesla not only as a scientist and inventor, but also as a distinguished patriot who proudly stressed his Serbian parentage and Croatian homeland. The newly opened Tesla museum at the birthplace of Nikola Tesla. The thematic park was opened for the occasion of 150 years since Tesla’s birth (born July 10, 1856). The thematic park is very well organized and consists of the newly renovated birth house of Nikola Tesla, a Serbian Orthodox church – where his father was a minister – and a multimedia center. The New Yorker Hotel is located in Midtown Manhattan on 34th St and the corner of 8th avenue, across Madison Square Garden and Penn Station. Empire State Building and Times Square are a few minutes walk. 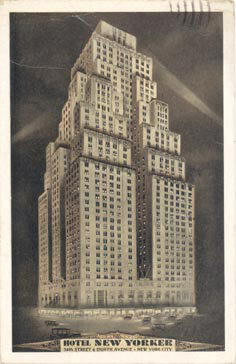 Tesla died in Hotel New Yorker on January 7th, 1943. City College’s mission emphasizes access and excellence in undergraduate and graduate education and research. Requiring demonstrated potential for admission and a high level of accomplishment for graduation, the College provides a diverse student body with exceptional opportunities to participate in creative intellectual pursuits. The College is led by a faculty committed to the advancement of knowledge and the guidance of students in the attainment of rigorous academic goals. Tesla´s AC replaced DC, extending the range and improving the safety and efficiency of power distribution. Tesla´s Niagara Falls system marked the end of Edison’s DC. The original AC power plant was the Edward Dean Adams Hydro-Electric Power Station Number, demolished in 1964. 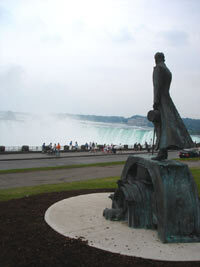 A statue of Nikola Tesla made by the artist Les Drysdale was unveiled at Niagara Falls on July 9th, 2006. Tesla stands on an AC motor, his cane sketching out the AC polyphase system in the sand. This appeared to Tesla in a flash of thoughts while he was walking in a park in Budapest. Les Drysdale is a well-known sculptor with public commissions in Toronto, Burlington, Hamilton and Stoney Creek. Speaking of his design Drysdale said: “Tesla is sculpted, as he would have appeared in 1896, age 39, about the time his inventions were being used to create The Niagara Falls Power station. My intention is to show the mystery that is his mind, developing an abstract idea from the theoretical to the concrete, as most of his inventions were developed entirely from start to precise completion in his head,” states Drysdale. The Museum houses Nikola Tesla’s entire estate. The archive of the Museum consists of personal belongings and more than 1000 photographs. Tesla’s correspondence and other paper-work such as patents and drawings you can find here. Opening hours: Tues-Fri 10-6, Sat and Sun 10-1, Mondays closed. The Tesla Tower in Shoreham, Long Island was 187 feet high. The spherical top was 68 feet in diameter. From here Tesla wanted to transmit electrical energy without wires. The Tower was never finished.